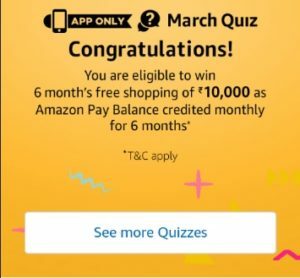 1 How to win 6 months free shopping from Amazon March Quiz? 2.1 Q1) Which of these is NOT a meaning of the word ‘March’? 2.3 Q2) In March the sun crosses the celestial equator and the day and night are of equal length. What is this phenomenon called? 2.5 Q3) In Shakespeare’s Julius Caesar what does the ‘Ides of March’ refer to? 2.7 Q4) Which of these is a western zodiac sign associated with March? 2.9 Q5) International Women’s Day celebrated on 8 March is a national holiday in Angola, Armenia,Azerbaijan,Cambodia, Georgia, Eritrea, Kyrgyzstan,Laos, Moldova, Mongolia, Tajikistan, Uganda, Ukraine and Zambia. 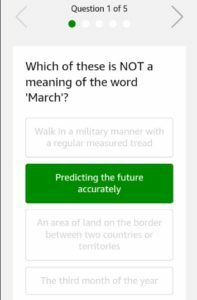 Amazon conducts quiz on the name of months, and Amazon March Quiz is back. In this contest, you can win 6 months free shopping. You have to answer 5 simple questions of March Quiz. 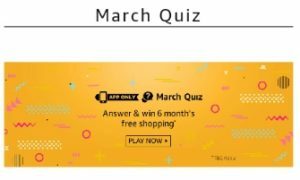 We added Amazon March Quiz Answers, so that you can easily give answer and win free shopping prize. Indirectly, winner will get worth Rs 60000 shopping. So, check the Amazon March Quiz Answer for detailed information on this. This Quiz at the last of the Homepage in the Amazon App. You will see the above shown image of Amazon March Quiz. One winner will be selected for shopping worth Rs 60,000. Rs 10,000 per month will be given to the winner for shopping at Amazon.in. So, answer all the question of Amazon March Quiz, and grab this awesome offer now. 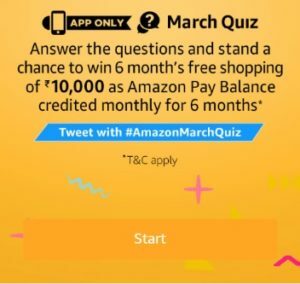 How to win 6 months free shopping from Amazon March Quiz? 2. Open the app and you will see a banner about the March Quiz Time contest. Click on it. Q1) Which of these is NOT a meaning of the word ‘March’? Q2) In March the sun crosses the celestial equator and the day and night are of equal length. What is this phenomenon called? Q3) In Shakespeare’s Julius Caesar what does the ‘Ides of March’ refer to? Q4) Which of these is a western zodiac sign associated with March? Q5) International Women’s Day celebrated on 8 March is a national holiday in Angola, Armenia,Azerbaijan,Cambodia, Georgia, Eritrea, Kyrgyzstan,Laos, Moldova, Mongolia, Tajikistan, Uganda, Ukraine and Zambia. 1. This Contest will commence on 1st March from 12:00:01 a.m. (IST) to 31st March11:59:00 p.m.